Isn't it weird that Mohammad has the word 'Ham' in it? I thought so even if you didn't. 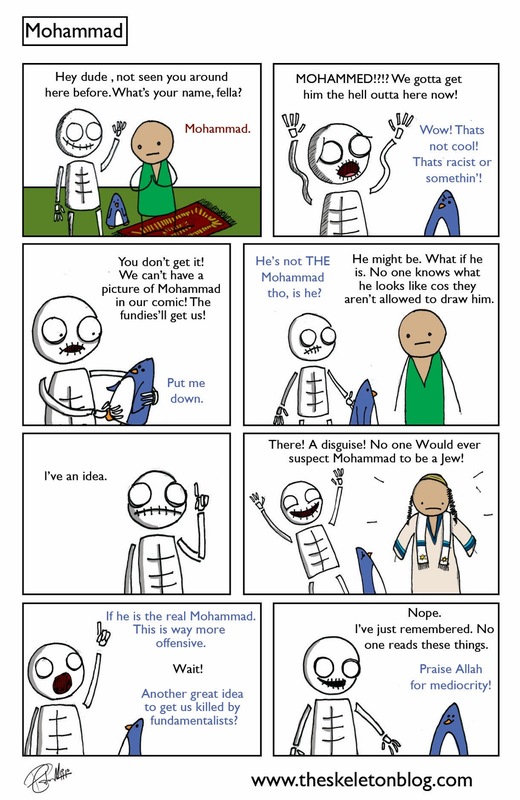 I'm not allowed to tell you if that IS the real Mohammad or not. He could be. Maybe he isn't. If he is then fundamentalists have just cause to butcher me and torch my flesh. If not, then I'm allowed to draw him. What if I did a drawing of him and just drew his clothes because he drank an invisibility potion? It's not a drawing really as you cant see him but I know he's there. wearing those clothes. I'm confused with this whole set up. I'm just going to go draw Moses as that's less hassle. Enjoy your day. P.S. If Moses and Mohammad set up a business they could call it Prophets for Profit.